There was a time when 'Dilli chalo' was a rallying cry for those hopeful of reclaiming the dignity of their lands and lives. Today, Dwalpment has relegated this slogan to history and mawkish sentimentality. For, today, there is no need to march to Dilli; Dilli has marched up to everybody's doorstep, via Dwalpment. Into huts, hamlets and distant tracts of forest, via highways and half-made tracks, up a mountain slope and down a valley, Dwalpment turns up to present its dreaded vision of the future. But there are those who see in that future the death of their streams, their very dreams. And so from huts and hamlets, in distant tracts of forest, along highways and half-made tracks, on a mountain slope and in a valley, there has emerged a demand unmask it. The future will be different. We celebrate two thorns in Dwalpment's side. 1994 The Union ministry of environment and forests (moef) comes out with a notification on eia, made mandatory for certain kinds of industrial and developmental activities, to minimise environmental and social damages, or mitigate such effects in projects that could not be avoided. The 1994 notification is amended 12 times in 11 years. Some amendments are positive, like the one in 1997 which made a public hearing mandatory for eia. Most others dilute the eia process --especially the public hearing, in which project proponents and the government are forced to face people affected by the project. Soon, public hearing becomes a thorn in the side of development projects. In all, the amendments rendered the original purpose of the eia exercise meaningless. September 2006 A new procedure to conduct eia put in place. moef goes ahead with a draft based mostly on consultations with government departments and industry associations. Non-profits and social groups conveniently left out. A controversial clause deals with public hearing norms. August 4, 2007 In an unusual incident, Monnet Ispat and Energy Ltd's public hearing in Raigarh, Chhattisgarh, called off. The company's plans to expand its iron and steel plant run into trouble, given irregularities in its eia report. eia for the project is prepared by Min Mec Consultancy of Delhi, based on certain terms of reference given by the moef. The terms of reference do not take into account the fact that a plant already exists at the proposed site. The eia report does not take into account the environmental impacts of the existing plant. The public hearing is chaotic. People raise several issues, including the impact on water resources and biodiversity. The data in the report is questioned, people say information on the study area of the eia is unclear. The consultant is not available. 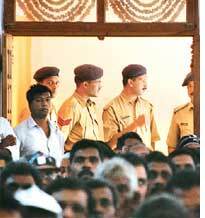 January 31, 2008 A live account "Every chair of the community hall of the Shree Shantadurga temple in South Goa's Quepem taluka was taken. In a few minutes, the public hearing for Shakti bauxite mines was to begin. Then there arose a whisper the temple had objected to the hearing being held in their premises; it was being called off. It was the second time the hearing was convened and this time, too, the villagers told us, the 30-day notice rule had been violated. The panchayats were informed just two days ago that people should state their objections, if any, to the expansion plan of the bauxite mine--an increase in production from 0.1 million tonnes per year to 1 million tonnes, requiring an increase in mining area from 26 ha to 826 ha--in this forest-paddy region of Goa's hinterland. From the open window I could see a large police battalion gathering. "The hearing began. The company was requested to explain its project--a Powerpoint presentation in English was simultaneously translated into Konkani. Listening to the presentation, everything seemed taken care of. But this was before the residents--from politicians to villagers to church representatives--got up to speak. They ripped through the eia report prepared by an unknown consultant." The rti Act has become an instrument with which to unmask both governments and corporates. Protest against Kundil Sponge Iron Ltd's unit in Londa town in Belgaum district, Karnataka. "We didn't want the unit. It was thrust upon us. Pollution levels are unimaginable and our houses are covered with soot," says Shekhar Mithare, Londa resident. After they find out through an RTI, over 10 villages in Khed taluka of Maharashtra launched a large-scale protest against a Dow Chemicals research and development facility slated to come up in village Shendi, 30 km from Pune. The state turned over to Dow 40 hectares of grazing land, and consented to Dow using 20 hazardous chemicals. On April 7, a second round of indefinite hunger strike, called by Affected Citizens of Teesta to protest the Sikkim government's failure to scrap a series of dams planned on the river Teesta and its tributaries in North Sikkim district, entered its 27th day. At a July 4 hearing, Maharashtra Information Commission fined two forest officials Rs 25,000 for withholding information sought under RTI. When Madhumita Dutta of the Corporate Accountability Desk, a non-profit in Chennai, filed an rti application with the Union Ministry of Chemicals and Fertilizers to find out the Centre's stand on white asbestos early this year, what she got astounded her. The government was preparing a report that said hazard to workers' health from white asbestos (called chrysotile) was manageable. The study on which the ministry's report was based, she found, was paid for (Rs 16 lakh) by the Asbestos Cement Product Manufacturers Association; the government paid Rs 43.66 lakh. The mineral accounts for 94 per cent of the global trade in asbestos and is used as binding fibre in cement, fire retardants and automobile brake lining, among other things. who lists it as a human carcinogen, killing at least 90,000 people every year of asbestos-related diseases such as lung cancer. The Indian government has traditionally preferred the asbestos cement industry, consistently ignoring evidence of the mineral's harms. The report enabled India to go to Rome in October 2008 and argue in favour of unrestricted trade of white asbestos under the Rotterdam Convention. India, along with Canada and Russia, is seen as the dirtiest player in the international negotiations to bring white asbestos in the 'prior informed consent' (pic) list of the convention, which will require exporters to obtain the importers' prior consent. On April 23, 2008, a case dubbed a "conflict between commercial interests and public health" came up at the Delhi High Court. There were two players the Central Information Commission (cic) and the seed company Mahyco. Fearing its data on field trials of genetically modified food crops will become public, the company in December 2007 filed a petition against the commission in the high court. The petition followed an rti application. Divya Raghunandan of Greenpeace had sought disclosure of gm food trials. The application said that access to "safety" data is difficult when commercial interests are involved. The case assumed importance because if the verdict favoured industry, its demand to keep data away from the public would become stronger. Such instances are plenty in the drug industry where many companies refuse to share data on clinical trials on the pretext of protecting their commercial interests. The point is for how long?